Vallarta Store Ad October 22 - 28, 2014. Fresh Marinated Chicken Drumsticks Sale! 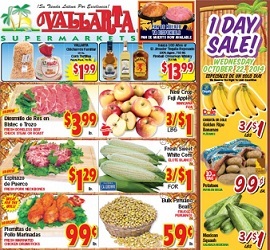 Vallarta Store Ad October 22 – 28, 2014. Fresh Marinated Chicken Drumsticks Sale! – $9.99 Head & Shoulders Shampoo Classic; $1.99 Springfield Pie Shells; and more.